. : Publication date :: Reads: 5960 :: :: :. In the second half of this decade, the field of professional businesses focusing on African hip hop is growing like never before. When it comes to internationally operating record labels maintaining a catalogue of African hip hop acts, there's still only a handful of players on the market, of which OutHere (Germany) and Nomadic Wax (USA) have probably had the most exposure. Last year a new name surfaced that made some noise with its plans to launch a compilation cd/dvd and offer a back catalogue of classic releases. Skip to April 2006 and Afrolution Records has a face, a website, a first release and the promised back catalogue. Run by a team of Zimbabwean and South African born guys who have been active in the music industry for a while, Afrolution records is a sub-label of Black Mango Music, which used to be known as Amabala and has a catalogue of mostly South African electronic beats compilations, catering for a largely different crowd than Afrolution itself. We had the pleasure of meeting Trenton Birch, the driving force behind Afrolution, while he was in the process of compiling his first compilation. Despite the inevitable reserved attitude which we at Africanhiphop.com have learnt to show towards big plans and dreams, which often prove to be to good to be true, the label managed to break the ice by coming up with their Afrolution Vol. 1 compilation. Each African hip hop label will have to create its own niche within the world market, which may be big but is also small enough to have these labels bump into each other on the regular, for example in seeking airplay and headline space on the bigger media. Afrolution's speciality, judging from the artists that were picked for their first releases, seems to be a focus on hip hop which is firmly rooted in the 1990's conscious, underground movement which we tend to identify with the American east coast sound. This goes for the back catalogue of albums by Metaphysics (Zimbabwean emcee based in Germany) and Cashless Society's classic 'a�frican raw material', but also for the names on the 'Afrolution volume 1' cd and dvd. The cd compilation doesn't go out its way to unearth rare gems from African backstreets or Unsigned Hypes; most names sound familiar to anyone who has been following this website or other cd's that have come out over the years. Its real strength is in presenting the right pick of tracks which all seem to share a raw feeling and a lyrical urgency. Most artists are of the 'no compromise' type which may hurt their options back home to exploit their music commercially, but which gives them a street popularity, examples are Black Noise's Emile YX who is present with the track 'Who am I', or Cashless Society with 'Taxi Wars'. Many artists are from Southern/Eastern Africa such as Migrant Souls and Divided Kingdom Republic (Zimbabwe), Real Elements (Malawi) and Wawesh (Kenya). Then there's JJC and X Plastaz who both seem to bless almost every African hip hop compilation that comes out. The novelty of this compilation is the free bonus DVD which contains music videos including Mjanja by Wawesh, Kilonsele by JJC, Taxi Wars by Cashless, alongside footage of the 2004 African hip hop Indaba in South Africa and interviews with the likes of Metaphysics, Speech (of the more or less old school US group Arrested Development) and dj Eric Soul from UK. 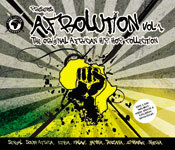 Official release date is 26 June 2006, but the album is already available at the Afrolution website.